NEW ROOF INSTALLED 8/18! COMPLETELY UPDATED! MOVE-IN READY opportunity in Pasadena Estates, a quiet family-oriented neighborhood. This 3 bedroom/3 bath/1-car garage home greets you with great curb appeal: a low maintenance Xeriscaped corner lot, nicely landscaped gardens, quaint porch area, newer double paned windows, and new front door. Upon entering, a neutral dcor welcomes you with recently restored/polished Terrazzo floors, Plantation Shutters, designer light fixtures and 6 panel doors throughout. Living and Dining Rooms are light infused and spacious. 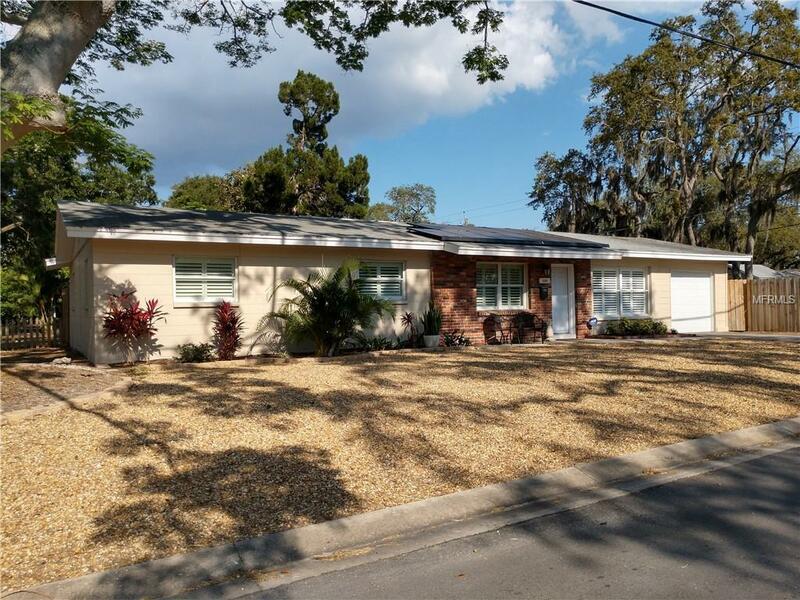 The remodeled, eat-in Kitchen offers granite counter tops, new wood cabinets with soft close doors and drawers, under counter LED lights, stainless steel sink, faucet, newer Whirlpool appliances and a closet pantry. Over-sized Master Bedroom easily accommodates a King-size Bedroom Suite and offers his/hers wall closets. All 3 Bathrooms have been remodeled. Inside Laundry Room! Other updates include Solar panels resulting in significant electric cost savings, irrigation system using well water and an automatic drip system for all flower beds, fenced back and side yards, a covered paver patio with a large hot tub, exterior doors and a reinforced garage door. Conveniently located near shopping, restaurants, banks, hospital and a short drive to the gulf beaches or downtown St Petersburg. Schedule a showing today!